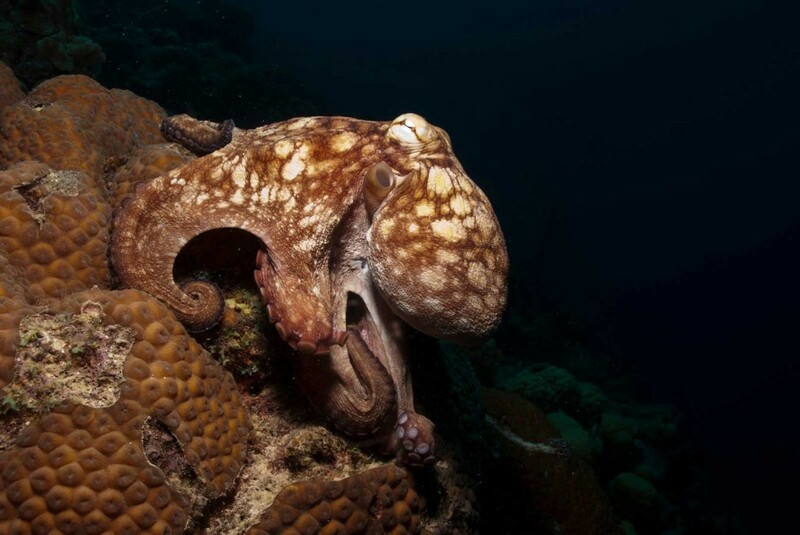 Octopuses are the most intelligent creatures of all invertebrates (an animal without a backbone). With no internal or external skeleton, octopuses are able to squeeze into (and out of) tight places to escape their predators. They are called the Einsteins of the invertebrate world. Scientific studies have shown that octopuses are animals with feelings. – three hearts: Two hearts pump blood to the two gills and the third pumps blood throughout the body. – blue blood: The blue color comes from hemocyanin, containing copper. – a head called mantle where all the vital organs are located. – a hard beak, like a parrot beak, which they use to break into and eat their prey such as crabs and shellfish. – Special pigmented skin cells called chromatophores that can be expanded and contracted to hide or expose color and because of this ability is a master of disguise. They use these cells to They can hide in plain sight by blending in with their surroundings. An octopus doesn’t live very long, about 3 to 5 years. The female octopus can lay about 400.000 eggs which she looks after until they hatch. She blows currents across the eggs to keep them clean and protects them from predators. The eggs might incubate anywhere from two to 10 months, depending on the species and the water temperature. Once they hatch, they’re on their own. While taking care of the eggs the octopus will stop eating and will die of starvation, soon after all the eggs hatch.